I'm all about classics: food, cars, movies and fashion. They're classics for a reason, aka they'll never go out of style and you'll always look cool with them. Sure, I love trends but at the end of the day I will always go back to my tried and true loves. So I thought I'd share the 10 things I think every woman should own. All of these items can create countless, effortless looks that are both put together and sophisticated. 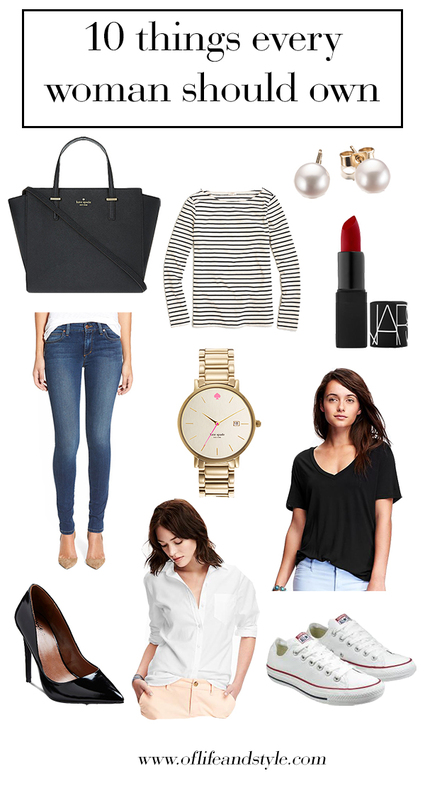 Throw on the striped tee, jeans, Converse, red lips and pearl earrings for running errands, grabbing a bite to eat or shopping. Or for something a little more dressy pair the jeans with the white button down and pumps for a polished up look. What are your classics every woman should own? Agree with any I listed? Any I should add? Leave me a comment sharing!